Backpack enables Pickup, Store, Show, Use and Drop items around your game scene. Backpack enables developers to implement a simple, yet powerful, pickup and inventory system. Allow your player or NPC to pickup game objects at the scene, and manage an inventory is a key functionality in many game genres, like RPG, Survival games, Horror Action games, First Person Shooters, Sandbox games, and major action or arcade games. In Backpack implement a realistic approach for pickup and inventory functionality, using the best of Unity Prefabs and Script capabilities, creating a powerful inventory system. You only need to add the item pickup component on each game object, and include our powerful backpack prefab on your avatar player or NPC. That is all. You can now pickup, store, show, use and drop items around the scene. 1. Pickup, Use and Drop any scene game object. 2. Stores the real object, so you can use it at the scene after drop. 3. Manage item content and capacity. 4. Manage item fill-up with more content. 5. Limit Inventory Capacity by Quantity, Volume or both. 6. Display any item atribute at the HUD. 7. 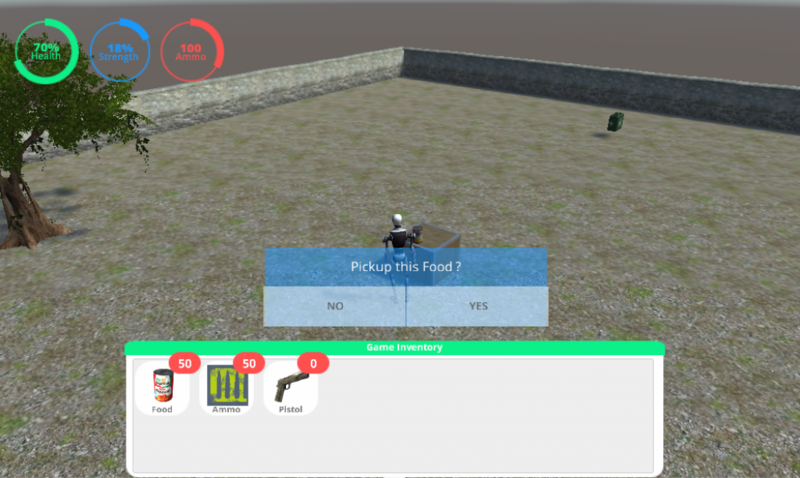 Basic Inventory HUD Implementation. 8. Basic Player HUD Implementation. 9. Basic Pickup Message Implementation. 10. You can also use on NPCs. If you have any special need or want to suggest new features, we will be glad to help you, and in some cases implement it as part of this package. Contact us at TorresLabs.com. Note that this package is about scripts that implement a powerful, yet simple inventory system. All the art here are for demo purposes only. If you intent to directly use this package art on your game, please read the Demo Scene Considerations sections. This entry was posted in Unity Asset Store. Bookmark the permalink.